Looking for a rewarding career? Meet Sheriff's 9-1-1 Dispatchers and apply for open positions during a job fair: https://bit.ly/2QOcfOq. Not all heroes wear a badge. 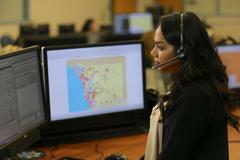 Before deputies can respond to emergencies, 9-1-1 dispatchers are the first line of help. If you're looking for a rewarding career, you can apply for open positions at the Sheriff's Communication Center. Join us for a job fair and speak with a dispatcher about the application process. The Sheriff's Communications Center is hiring both entry level (no experience needed) and lateral dispatchers. Starting pay for entry level dispatcher is $ 21.14/hour. Pay jumps to $25.48/hour after approximately one year on the job. For more information about these positions, as well as benefits and pay, visit http://joinsdsheriff.net/dispatcher.